It's been all thunders storms here in Charlottesville. The kind that turn the sky blue-grey and get the streets crackling with electricity. The kind that turn creeks into rivers. The kind that make me open my windows, light candles. The kind that make me think of a cool Autumn right around the corner. I feel really thankful for the rain. It almost feels like a break in time, an extra breath. I've been using the cloudy days as respite, reading poetry and journaling. Quietly exploring recipe concepts in my softly-lit kitchen. This Summer has been reminding me about the important of simplicity. The joy in simple pleasures with Logan by my side. Eating cherries together by a lake. Going for an evening walk around the city. Eating ice cream on the front stoop. So too, all of the recipes coming to mind lately are about highlighting the beauty of simple flavors. Peanut butter ice cream with cocktail cherries. Chilled melon soup with basil oil. Desserts are stripped of their process. Everything is ice cream, pie, popsicles, panna cotta. Dinners ate all about incorporating whatever fresh veg I've collected from the garden our picked up at the farmers market. Tomatoes are in everything and I'm loving it. And smoothies? I'm sticking with the classics. It's nice cream or bust in the Byrd house. 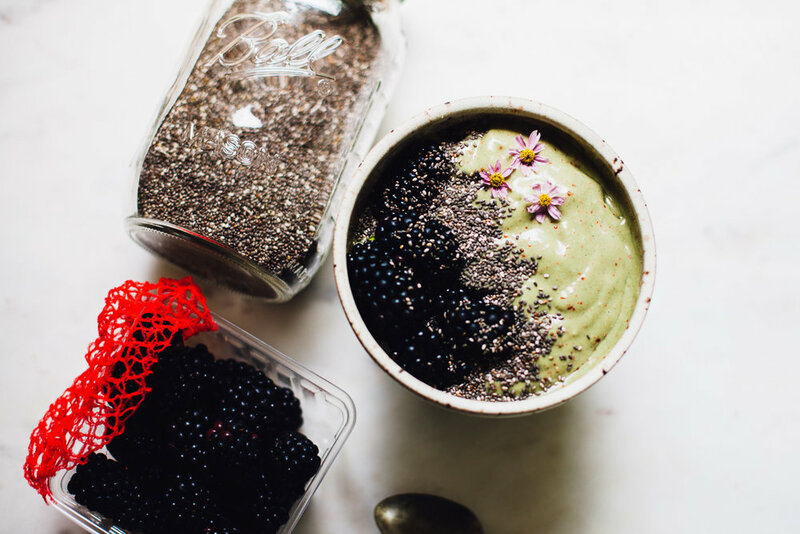 For today's Smoothie Sunday I'm sharing this Spirulina Banana Mango Smoothie Bowl! The tropical fruits marry with the creamy, nutty fats to completely zero-out the otherwise oceanic flavor of the spirulina. You can't even taste it. I added some goji berries for a vitamin c boost -- plus I like the tanginess they add to this creamy bowl. 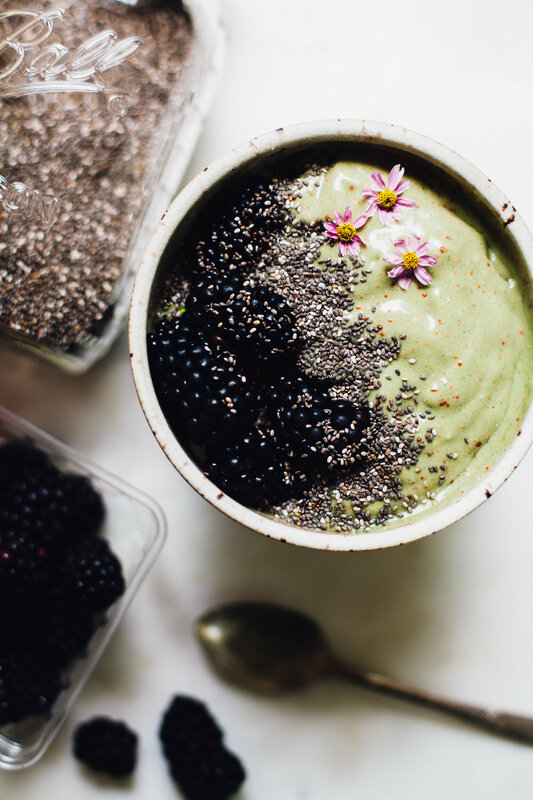 My go-to toppings for this Spirulina Banana Mango Smoothie Bowl are loads of fresh blackberries and chia. But, seeing that it’s mid-Summer, I can’t get enough of the juicy local blackberries I’ve been getting at the farmers market. Use the juiciest, sweetest berries you can find as a topping for this! p.s. those are "tickweed" flowers which are technically edible but they're bitter as hell. Just fyi. Optional: add 1/2 teaspoon vanilla extract as you like, if you’re into that. Combine everything except for the toppings in the bowl of a high powered blender. Blend, scraping down the sides of the bowl as you need to get everything smoothly blended. It will be thick like soft-serve ice cream. Top with blackberries, chia and edible flowers!